As one of the easiest nature destination in Bali, Tukad Cepung Waterfall can be accessed with either a motorbike or car. It is located near Ubud and it is also near another waterfall destination named Tibumana Waterfall. The trail leads to the waterfall is jungle-like so it is perfect for people who love walking through an adventurous path. The waterfall Tukad Cepung is considered as one of the unique waterfalls on the entre Bali. It is a famous and popular tourist destination for both local and international. Aside from that, the pace is also very Instagram-able, which mean that you can get a good photo with a nature background on this place. During your way to the waterfall, you will stumble upon a knee-high river and a few rocks. The estimation time to reach the waterfall is around 15 minutes. 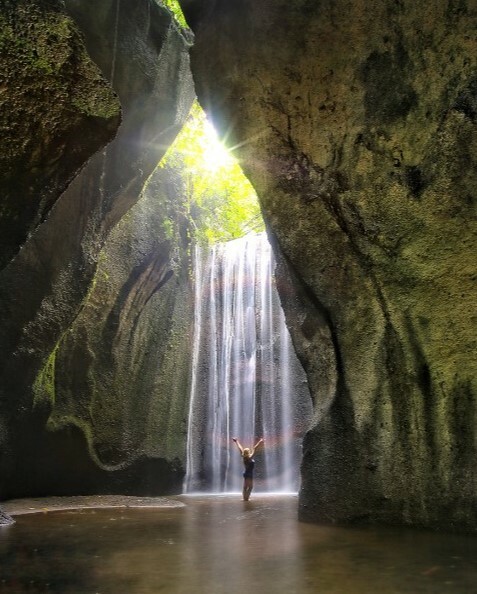 This waterfall near Ubud can be a very beautiful place, especially during the sunny day because you will get a stunning view where the sun ray will pierce through the hole of the waterfall's roof, which is a natural stone formation that beautifully covers the entire waterfall. Once you reach the waterfall, you can enjoy and refresh yourself by swimming. The splash of the waterfall is also not that disturbing to those who want to take out their gear to take photos. But, you might want to bring some kind of protection for your gear in case the flow of the waterfall or the weather is unfriendly, causing the waterfall becomes a little bit disturbing. As for the time to visit the waterfall, it is recommended that you go there around 10 AM so that you could catch the sun rays. If you want to visit the waterfall, then it is best to book a place to stay around Ubud. This is because the destination can be accessed from Ubud in a short time. There are several options according to your budget when choosing a place to stay in Ubud. If you have a good amount of budget and want a luxury place to stay, then the best option could be the Laya resort in Ubud. Another place for luxury accommodation is to book a place at Hanging Gardens of Bali. For middle budget accommodation, then you should check the place called Pertiwi Bisma 2, which is quite luxurious with palm tree forest surrounding the place. The villa here is cozy and comfortable with the immaculate ground. Aside from that, it is probably the best and nearest place from the destination. But, if you want to limit your budget on accommodation and have a backpacking trip, then it is best to check the Sila Urip Guest House. A lot of good reviews have been submitted online by various tourists. The place is near the Tukad Cepung waterfall, so you should check it out.